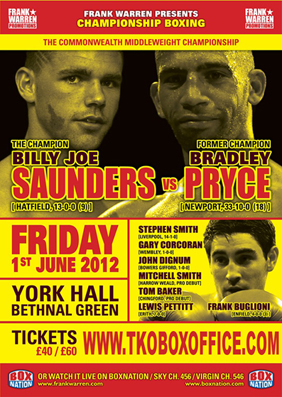 Tomorrow night at York Hall, Bethnal Green, London, Billy Joe Saunders will make the first defence of his Commonwealth Middleweight title against former Commonwealth belt holder, Bradley Pryce. On the under-card we will see Stephen Smith, Frank Buglioni, and Lewis Pettitt in action. 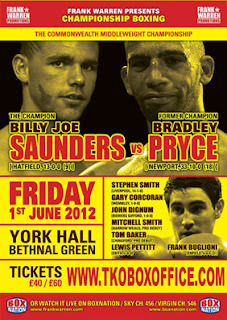 Smith will be involved in an eight round fight, Buglioni and Pettitt are both scheduled to fight for six rounds. Here is a video of today's weigh-in, it shows Billy Joe Saunders, Bradley Pryce, Stephen Smith and Jose Luis Graterol stepping on the scales. What are your predictions for tomorrow night?